Video Games For Christmas This Year? Will You Be Asking For Video Games This Xmas? Will You Be Giving Video Games As Gifts This Year? Just got Elder Scrolls online as a early Christmas gift. Took 12 hours to get it to work. "All dreams are but another reality. Never forget"
Definitely to both. Hoping for some atari 2600 essentials I'm missing, as well as some NES stuff. I'm giving a boxed missile command (2600) and a NES advantage joystick to family. A Sinclair ZX Spectrum Vega, it was delivered yesterday! to go in his stocking for Christmas. Shhh, don't tell! I'm not gonna lie, I got wasted tonight and ordered Stella's Stocking for myself because my sister thought Al wasn't a legit store and would rip her off. I'd want Apple II floppies and a Sega Saturn. I'm asking for and giving video games, just like every year. I doubt I'm getting any (I never do unless I buy them, wrap them, and write "From Santa" or something on them), except for a NIB red box Space Invaders for 2600 (I'm curious to see what kind of manual is in there; I don't think I've ever heard of a red-label version manual for Space Invaders). But my brother's into '90s systems, so I got him a couple of Jaguar games (Val D'Isere Skiing and Checkered Flag, both CIB) and Jaguar AV cables, Street Fighter: The Movie: The Game for Saturn, and Primal Rage for 3DO. My maybe turned into a yes. LEGO Dimensions caught my eye while I was looking for gift ideas at Toys R Us. My roommate is a big LEGO fan, and getting bigger by the second thanks to all the LEGO bricks he gets to sort through when they come into the thrift store where we volunteer. His nephews also have some LEGOs they play with, so I figured that would be something the roomy and the boys could play with together. It's interesting all the different tie-ins they've released for Dimensions so far. There's even a Portal expansion. And I got some games from my Secret Santa. I'm only 14 so... yes. And... no, I won't be giving any games this year. You're 14 and you have a Commodore 64?! That. Is. Awesome! There is hope for the future, after all! Lol! Yeah, I like me old games! 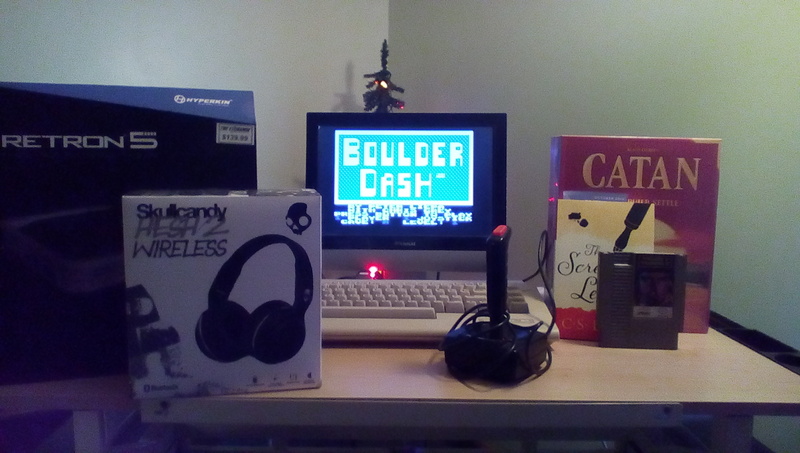 I got all the things I wanted, and thanks to my uIEC/SD, I am currently enjoying some Boulder Dash. Edited by Link6415, Fri Dec 25, 2015 1:07 PM. Then there's my fiancé, who apparently wanted to re-live the year of the xbox with a generously dickish gift- he got me a PS4. Which is great, I did want a PS4. I don't own anything that accepts an HDMI signal. The plan for 2016 was remodel closet, new tv, THEN PS4. So, the system is currently attached to my parent's TV while I scramble to do the other stuff. At least the plan was in place, I guess? I got my brother Street Fighter: The Movie (Saturn), Primal Rage (3DO), Val D'Isere Skiing & Snowboarding and Checkered Flag (Jaguar), and some Jaguar AV cables. So it was a pretty gametastic Christmas at my folks' house this year. Technically I got South Park, Pigs In Space, and the VIC carts for myself, but if I want games for Christmas, I need to help my family out a little bit. Didn't ask for video games, but my wife did get me a gift certificate for Underground Retrocade.